, an ingenious French writer, whose talent was Latin poetry, was born at Chinon, in Touraine, about 1602. Early in life he studied physic, and practised it for some years. 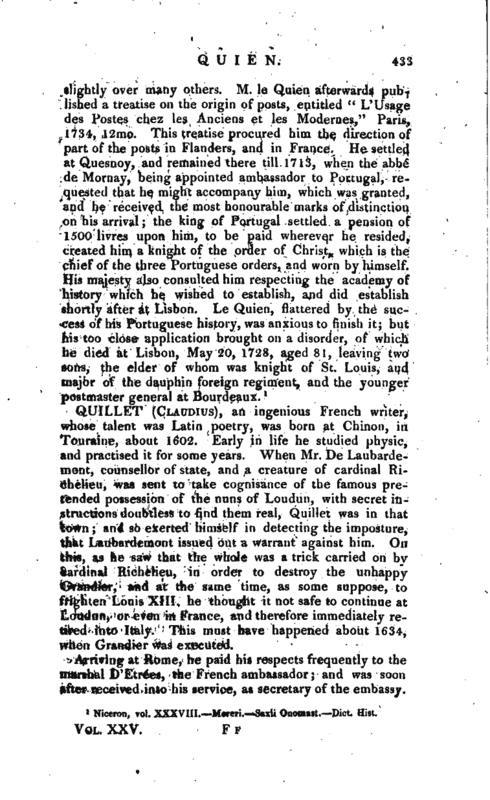 When Mr. De Laubardemont, counsellor of state, and a creature of cardinal Richelieu, was sent to take cognisance of the famous pretended possession of the nuns of Loudun, with secret instructions doubtless to find them real, Quillet was in that town and so everted himself in detecting the imposture, that Laubardemont issued out a warrant against him. On this, as he saw that the whole was a trick carried on by cardinal Richelieu, in order to destroy the unhappy Grandier, and at the same time, as some suppose, to frighten Louis XIII. he thought it not safe to continue at Loudun, or even in France, and therefore immediately retired into Italy. This must have happened about 1634, when Grandier was executed. Arriving at Rome, he paid his respects frequently to the marshal D’Etre*es, the French ambassador and was soon after received into his service, as secretary of the embassy. | He seems to have returned with the marshal to France, after the death of cardinal Richelieu. While he was at Rome, he began his poem called “Callipsedia” the first edition of which was printed at Leyden, 1655, with this title, “Calvidii Leti Callipsedia, seu de pulchrae prolis habendae ratione.” Calvidius Letus is almost an anagram of his name. It is not known, what cause of offence he had with cardinal Mazarine; but it is certain, that he reflected very severely upon his eminence in this poem. The cardinal, however, sent for him and, after some kind expostulations, assured him of his esteem, and dismissed him with a promise of the next good abbey that should fall; which he accordingly conferred upon him a few months after this effectually removed all Quillet’s dislike, and he dedicated the second edition of his book to the cardinal, after having expunged the passages which had given him offence. The second edition of “Callipoedia” was printed at Paris, 1656, with many additions, and Quillet’s proper name to it: and the author subjoined two other pieces of Latin poetry, one “Ad Eudoxum,” which is n. fictitious name for some courtier; another, “In obitum Petri Gassendi, insignis Philosophi & Astronomi.” These are all the productions of Quillet which ever came from the press; although he wrote a long Latin poem in twelve books, entitled “Henriados,” in honour of Henry IV. of France, and translated all the satires of Juvenal into French. 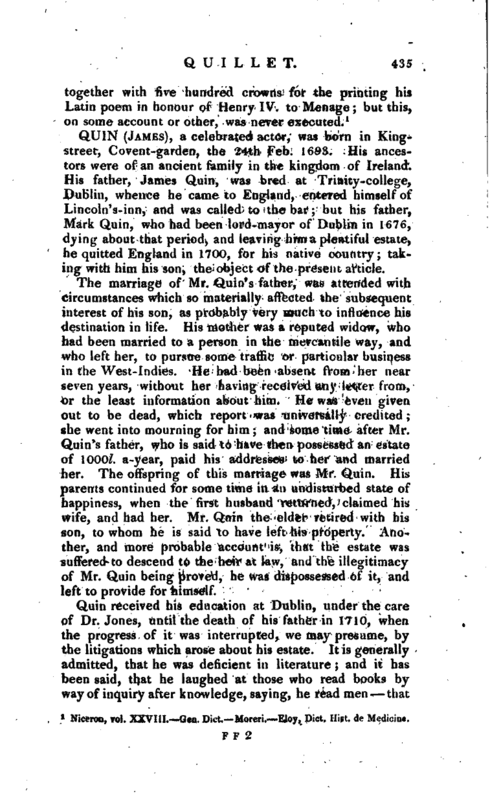 The singular plan of the “Callipgedia,” the division pf the subject, the variety of its episodes, and the sprightliness of style, have procured it many readers; but the language is not always pure and correct, and the subject is certainly treated in a manner too licentious. De la Monnoye very justly thinks the great reception it has met with, owing principally to the subject; which, he says, is often treated in a very frivolous way, especially in the second book, where there are many lines concerning the different influences of the constellations; nor will this critic allow the versification to resemble either that of Lucretius or Virgil. 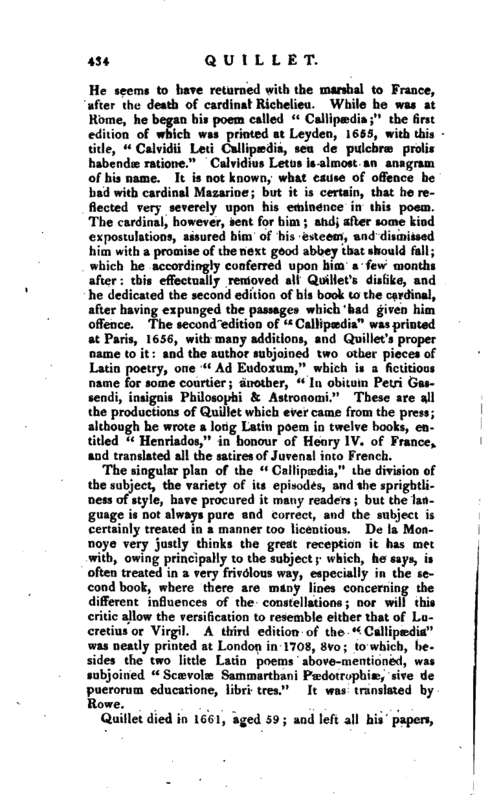 A third edition of the “Callipaedia” was neatly printed at London in 1708, 8vo to which, besides the two little Latin poems above-mentioned, was subjoined “Scaevolse Sammarthani Paedotrophiae, sive de puerorum educatione, libri tres.” It was translated by Rowe.